The Kentucky Derby revs up this Saturday at 6:24PM Eastern, and I’ll be watching. Not because I’m a huge fan of the horses, but because it gives me an excuse to sip on Mint Juleps! The next step is the tough part: the battle of the bourbons! The recent explosion of choices on the bourbon market has made it all but impossible for the average imbiber to know which bourbon is best for their tastes. My suggestion for this is to go to a trusted bartender and explain that you’re new to the bourbon world, and could you have the tiniest of tastes and sniffs of what he’s got at his bar. Chances are, you’ll get a sampling of some of the better known brands: Maker’s Mark, Woodford Reserve, perhaps Buffalo Trace or Bulleit, and the standard Jim Beam. This is a very good start. If you have deeper pockets, go to the manager of a trusted higher end liquor store and explain that you’ve had all the rest, now what does he think is the best? And of course, hinting to wife and friends that “I’m trying new bourbons” around your birthday, Father’s Day, or the holidays inevitably gets you a few bottles as well! A key ingredient for a perfect Mint Julep is crushed ice from clean, filtered water. Don’t even think of using tap water for any quality cocktail much less this one. Why ruin an expensive bottle of bourbon by going cheap on the ice? My fridge filters the water before making ice, so I put them in a canvas ice bag and bash them to the perfect crushed size. 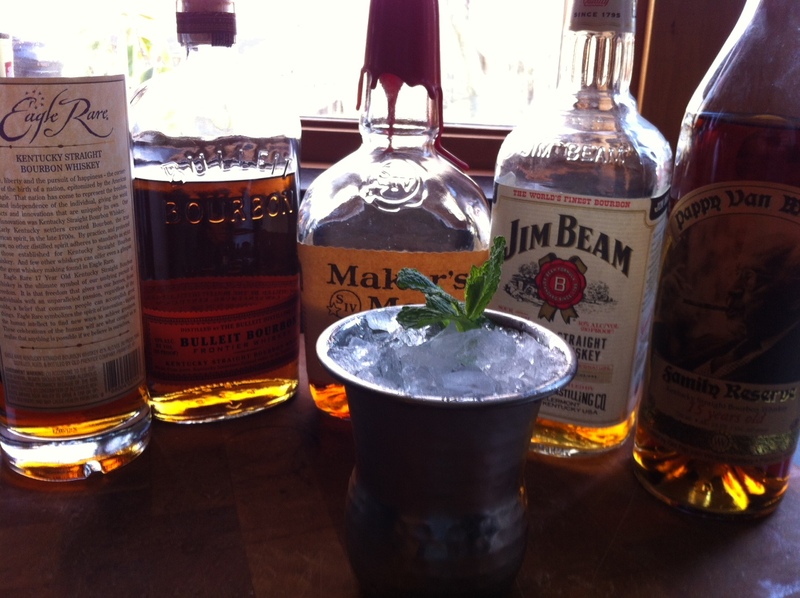 Crush the ice and pack it into the Julep cup, letting it dome slightly over the top. Don’t worry…the alcohol will melt it. I like to add a jigger of bourbon (1.5 oz. ), then the shot of simple syrup (1 oz. ), then another jigger of bourbon on top. Break off a few mint leaves from the stem and push into the ice. Using a long spoon, stir the drink well. A beautiful layer of frost will form on the outside of the cup. Add more ice, if necessary, and garnish with a sprig of mint.